Annually, over 50,000 deaths are attributed to heart valve disease (HVD) in the United States. The most common treatment for HVD, such as stenosis and regurgitation, is total valve replacement using mechanical and bioprosthetic heart valves, which often results in subsequent surgery to replace failed implants. For the pediatric population especially, a viable valve implant with the potential to repair, remodel, and grow within the patient is a great clinical need. Recent research has demonstrated that tissue-engineered heart valves (TEHV) have the potential to deliver a viable valve replacement, which is constructed with scaffolds and functional cells. Acellular heart valve (HV) scaffolds obtained by decellularization, biological polymer scaffolds, and synthetic polymer scaffolds have been widely used for TEHV fabrication, each having advantages and disadvantages. 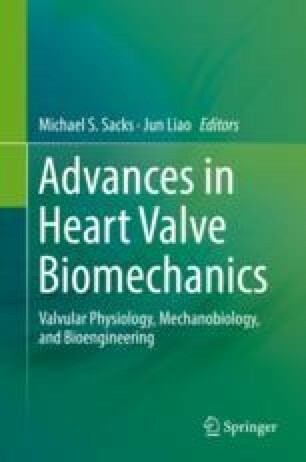 In this chapter, we focus on TEHV via a decellularization approach and provide a systematic review covering (1) the concepts of decellularization and current decellularization methods, (2) a comparative study showing how the ultrastructure and biomechanics of acellular HV scaffolds were affected by different decellularization methods, (3) the cell sources and bioreactor systems for TEHV reseeding, conditioning, and integrity testing, and (4) the current accomplishments of HV decellularization in animal studies and clinical trials and the challenges in moving this approach toward clinical applications. This work is supported in part by AHA BGIA-0565346U, GRNT17150041, NIH 1R01EB022018-01, 1R56HL130950-01, 1R15HL140503, T32HL134613, and NSF CAREER #1554835. The authors also thank the support from the Competitiveness Operational Programme 2014–2020, ID P_37_673, MySMIS code: 103431, contract 50/05.09.2016 and the Harriet and Jerry Dempsey Bioengineering Professorship.